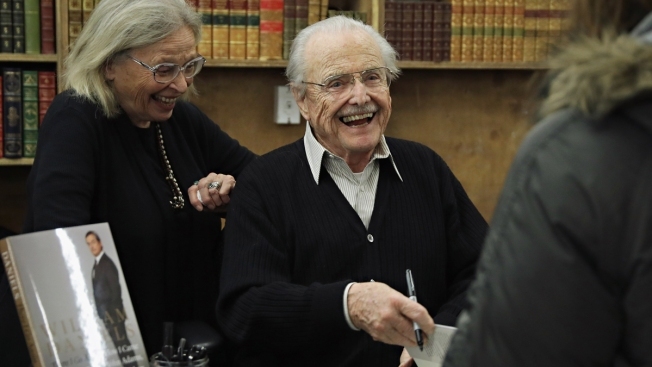 In this March 2, 2017, file photo, actor William Daniels meets fans with his wife Bonnie Bartlett (L) as he signs copies of "There I Go Again: How I Came To Be Mr. Feeny, John Adams, Dr. Craig, KITT and Many Others" at Strand Bookstore in New York City. The Emmy-winning actor who portrayed "Mr. Feeny" on the popular '90s sitcom "Boy Meets World" and Dr. Mark Craig on "St. Elsewhere" thwarted an attempted burglary at his San Fernando Valley home, it was reported Tuesday. "Someone tried to break in to the home of William Daniels and his wife Bonnie Bartlett on Saturday evening. Luckily, Mr. Daniels was able to frighten away the person and the LAPD quickly responded. They are both well. Mr. Daniels thanks all his fans for their concern," his publicist told NBC4. The LAPD confirmed the burglary attempt, but would not provide any more details to NBC4.